Oprah Winfrey and David Foster at the Vancouver Miracle Gala & Concert. Where Are They Now? . . . . . . . . . . Message from the Chairman . . . . . Message from the Director of Family Relations . . . . Pizza Party with Boston Pizza . . . . . Highlights of Vancouver's 2017 Miracle Concert & Gala . . . . . . . .
New Life Legacy Member . . . . . . . .
Where Are They Now? Organ donation gave these children a second chance. Look where they are now because of the gift of life. t 2 months old, Madeline Sam was diagnosed with a variant of biliary atresia. She had no working liver ducts and eventually developed portal vein thrombosis, which made her ineligible for a living donor transplant. At 7 months old, she was put on the waitlist for a liver transplant from a deceased donor. Due to Madeline’s deteriorating health,PROFILE she was transferred to Stollery Children’s Hospital in Edmonton. Madeline’s time was running out. 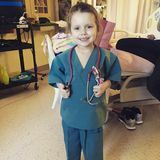 Doctors explained to her mother that she had a slim chance of receiving a transplant from a deceased donor in time and suggested they go ahead with a living donor transplant, even though there was only a 40% chance it would be successful. Madeline’s mother agreed to be tested, desperate to save her little girl. Less than 48 hours later, a deceased donor became available and 11-month-old Madeline received her life-saving transplant. Today, Madeline is in grade 7 and enjoys crochet, ballet and piano lessons. PROFILE Madeline Sam Age: 12 years Transplant: Liver Born: December 3, 2005 Burnaby, BC Liver transplant recipient, Madeline. Right, Madeline before her transplant. his has been an amazing year for the David Foster Foundation. We would not be where we are today without the hard work, dedication and passion of our sponsors, volunteers, staff and Board of Directors. Thank you to our National Partners and Life Legacy Members for their support in 2017. The Foundation was honoured to welcome Honda Canada Foundation and OUTFRONT Media as new National Partners, as well as Gain Group of Companies on Vancouver Island as new Life Legacy Members this year. This October, our 30th Anniversary Miracle Gala & Concert was held at Rogers Arena in Vancouver, British Columbia, back in the province where it all began. I was truly touched by the support of so many who came together to raise a record-breaking $10.2 million for Canadian transplant families. When the Foundation held its inaugural charity softball game in 1986, I could never have imagined how far we would come in the next 30 years. It has been an honour to have my good friends join me on the field and on stage to give their support to my Foundation. Oprah Winfrey and David Foster with Jim Pattison, the 2017 Humanitarian of the Year. 017 was a very special year for the David Foster Foundation. Reflecting on the Foundation’s 30th anniversary, I am overwhelmed with gratitude for all that we have been able to achieve in the past 30 years and for the generous support we received in 2017. This year we raised a record-breaking $10.2 million at our 30th Anniversary Miracle Gala & Concert in Vancouver. From the bottom of my heart, I want to thank all of those who gave their time and money to make the event a tremendous success. We had the chance to reconnect with several of our incredible families over the weekend. It was amazing to see how far they have come since receiving their life-saving organ transplant. We also had the honour of introducing one of our families at the gala, Chris and Tanis Wallace, and their two sons, Coen and Leighton, who shared their story with our gala guests. When neither of Coen’s parents was a match to be his living donor, their family friend, Don Davidson, went through the testing and discovered that he was a match for Coen. Don selflessly gave one of his kidneys to save Coen’s life. Hearing the emotion in Don’s voice when he spoke about his own children, and the honour he felt to be Coen’s living donor, was a powerful reminder of how precious life is. “This holiday season, give the gift of life— become a registered organ donor and talk to your family about why this decision is important to you.” power any of us has is to give to others. This holiday season, give the gift of life—become a registered organ donor and talk to your family about why this decision is important to you. From our family to yours, Merry Christmas and Happy New Year! I am looking forward to spending another holiday season with my beautiful family. This time of the year is filled with the joy of giving. Let us remember that the best gifts come from our hearts and that it is not how much we give, but how much love we put into giving. National Humanitarian of the Year, Jim Pattison, with DFF CEO, Mike Ravenhill. Message from the SVP, Fund Development The 300 By 30 Sponsor a Family 2017 Campaign. How did we do? you will recall, in our AsSummer 2017 newsletter, I introduced the 300 by 30 Sponsor a Family campaign and challenged you to help us raise enough money to support 300 families. Although the challenge was perhaps “cheeky” on my part, all for a great cause— creating more tomorrows for many children. Imagine—with the help of so many, with no donation too small, we not only achieved our goal... we exceeded it! THE CHALLENGE: Raise $3 million during our 30th anniversary to support 300 families. ACCOMPLISHMENT: Through the support of many, we raised $6.8 million. As a result, we will be able to support up to 680 families. On behalf of David Foster, the DFF Board of Directors and most importantly, our families and children, from the heart, we thank you and congratulate you! If you would like to support our families, I sincerely urge you to go online and pay through PayPal or send us a cheque by mail. To ensure that 100% of your donation goes to our Sponsor a Family campaign, please make sure you reference your wishes in an amount that is comfortable for you, as every dollar is important. There is no cost associated with becoming a registered organ donor, just 2-3 minutes to complete the online process. Please visit davidfosterfoundation.com to learn how you can become a registered organ donor in your province. The purpose of my message today is to congratulate everyone for the accomplishments to date and to urge and inform you on how you can help your fellow Canadians through a donation to DFF in support of families and/or by becoming a registered organ donor. By doing both, you will create more tomorrows for many Canadian families. Together, we can make a difference. Wishing you and your family the very best for a happy and healthy New Year! We clearly won the battle, but unfortunately, not the proverbial war. We anticipate that in the future, as a result of medical advancements and a greater availability of organs, we will need to support many more families in the years ahead. Standing still is not an option. • Did you know that in Canada, one person dies every three days due to the lack of availability of an organ? • Did you know that even though 90% of Canadians support organ donor registration, less than 25% are registered organ donors? In some provinces, less than 10% are registered organ donors. •	Did you know an organ donor can save up to 8 lives? Fraser Walters of The Tenors with John Danson, DFF SVP Fund Development, during the Sponsor a Family Campaign at the Vancouver Miracle Gala & Concert. 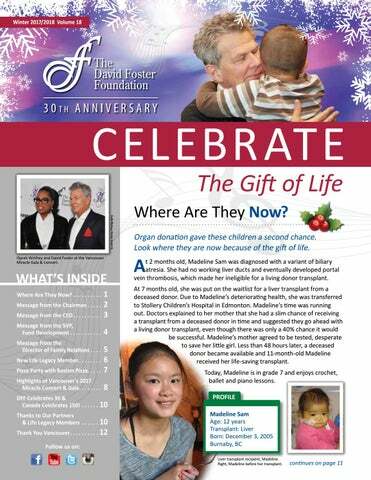 he David Foster Foundation has assisted over 1,100 families with children on the organ transplant waitlist in Canada. This year, staff and Board of Directors at the David Foster Foundation have had the incredible opportunity to reconnect with a number of these children and families and see how far they have come since receiving their life-saving organ transplant. as a parent having to make life or death decisions for your sick child, while also trying to meet the financial and daily needs of your family. On behalf of all of us at the David Foster Foundation, thank you for believing in our cause over the last 30 years and allowing us to be your voice of compassion. Without the support that we have received over the years from our National Partners, Life Legacy Members, financial donors, and volunteers, helping these families would not have been possible. Your support gives parents a moment to take a deep breath and care for the needs of their entire family. Lara Knuden, Director of Family Relations, with kidney transplant recipient, Ryker, at the Boston Pizza Party in Vancouver, BC. New Life Legacy Member On Track to Make a Difference! he most beautiful partnerships are the ones that continue to strengthen as time moves forward and the passion for a cause grows. 10,000 spectators come to enjoy the annual Vancouver Island Motor Gathering. David Foster at the grand opening of the Vancouver Island Motorsport Circuit in 2016. Peter Trzewik & Dr. Sylvester Chuang celebrating the opening of the Vancouver Island Motorsport Circuit. The David Foster Foundation entered a 4-year agreement with the Gain Group of Companies on Vancouver Island in 2015. Since then, they have been a valued Community Partner and have shown an inspiring amount of commitment to providing support for Canadian transplant families and enriching the local Vancouver Island community that they are a part of. There are more than 550 employees working in the group of 11 automotive dealerships, the luxurious Villa Eyrie Resort and state-of-the-art Vancouver Island Motorsport Circuit. The Foundation is honoured to announce that the Gain Group of Companies is extending their existing 4-year partnership, that concludes on December 30, 2018, to December 30, 2024, for a total of 10 years and one million dollars, making them a Life Legacy Member of the Foundation. The David Foster Foundation began in Victoria, British Columbia. Today, the Foundation has a national reach, with our head office still located on Vancouver Island. The Foundation has had the opportunity to be a part of the Annual Vancouver Island Motor Gathering held by Gain Group of Companies for the past 3 years. The Vancouver Island Motor Gathering is a family-friendly, fun-filled day on the track for a great cause, bringing together 10,000 spectators and many local sponsors from the community. This year, money raised from the event went to the David Foster Foundation, as well as the Cowichan District Hospital Foundation. It is truly remarkable to see the passion and generosity exemplified by Gain Group of Companies within their local community, while also providing support for Canadian families from coast to coast. Thank you, Gain Group of Companies for your commitment to making more tomorrows for Canadian families as Community Partners and Life Legacy Members of the David Foster Foundation. The Boston Pizza Party was held at Parq Vancouver and hosted many DFF transplant families. n Friday, October 20th, Boston Pizza hosted a very special pizza party for the David Foster Foundation. 11 transplant recipients and their families came to Parq Vancouver to enjoy pizza, crafts, and reconnecting with the Foundation. It is always an amazing experience when the Foundation has the chance to see first-hand how far some of these children have come since receiving their life-saving organ transplant. Among some of these families was Ryker. He was only 5 weeks old when his kidneys failed and he was put on perineal dialysis, living the first year of his life hooked up to a machine 12 hours a day. Ryker received his life-saving kidney transplant in October of 2016. Today, Ryker is almost 3 Â˝ years old and nothing slows him down. Ryker is just one of the children who Lara Knudsen, Director of Family Relations, had the pleasure of seeing on Friday. David, heart transplant recipient, and Steven, liver transplant recipient. Together, our transplant families, volunteers, staff, our Board of Directors, sponsors, and Life Legacy Members filled the room. Boston Pizza volunteers served pizza to all with enthusiasm, demonstrating the power of kindness in our community. The Foundation is honoured and proud to have Jim and Sandi Treliving as Life Legacy Members and Boston Pizza as a Community Partner. Boston Pizzaâ&#x20AC;&#x2122;s support over the years is truly appreciated by the Foundation. Thank you Jim Treliving and the Boston Pizza team! his year, the David Foster Foundation held the 30th Anniversary Miracle Gala & Concert in Vancouver, British Columbia on October 21st, 2017, bringing it back to the province where it all began with a charity softball game in 1986. Since then, the Foundation has held its annual fundraising Miracle Gala & Concert in various cities across Canada, raising money to provide non-medical financial assistance to over 1,100 Canadian transplant families. A record-breaking $10.2 MILLION was raised. Comedian Jay Leno had the audience in uncontrollable laughter! As always, we loved The TENORS performance! CeeLo Green sung his hit song "Crazy". Reba McEntire and Melissa Peterman met with Coen, kidney transplant recipient, and his brother Leighton. Raises $10.2 Million — Thank You! many others, walked the purple carpet. HLN’s Michaela Pereira and etalk’s Ben Mulroney emceed the evening. The gala saw dynamic, electrifying performances by The London Essentials, pianist William Joseph, and violinist Caroline Campbell to start off the evening—including William and Caroline being lowered from the ceiling on a floating stage. Gala guests and concert attendees watched performances by David Foster, Steven Tyler, Jay Leno, The Tenors, Carly Rae Jepsen, Reba McEntire, CeeLo Green, Matteo Bocelli and Laura Bretan. Jim Pattison and Walter Schneider are the David Foster Foundation’s 2017 Visionary Award winners. Jim and Walter have demonstrated extraordinary commitment to their communities while being outstanding and influential leaders. Steven Tyler closed the show with "Walk This Way" and had everyone dancing! We had the honour of introducing an incredible family, Chris and Tannis Wallace, and their two sons, Coen and Leighton, who shared their story with our guests. Coen received his life-saving kidney transplant from a family friend who stepped up to be his living donor in a beautiful act of selflessness, saving Coen’s life. A huge thank you to our Presenting Sponsor: Parq Vancouver & JW Marriott Parq Vancouver. The Wallace and Davidson families. Thank you to our National Partners and Life Legacy Members. To our Executive Gala Committee Chair, Peter Legge, and our Honorary Chairs, Jim Treliving and Scott Menke, your dedication and energy to the Foundation is appreciated. The success of the gala would not be possible without the dedication and generosity of all our amazing sponsors. Thank you Mandell Entertainment; Executive Producer: Executive Visions; Design & Graphics: Palettera; Luxury Sponsor: Bedat & Co; Red Carpet Sponsors: Boston Pizza, S.G. Cunningham, Bonnie & John Buhler; Media Partners: Global BC, Postmedia, Canada Wide Media Limited; Wine Sponsor: Inniskillin; Craft Beer: Bomber Brewing; Liquor Sponsors: Nütrl Vodka, Tempo Renovo Gin; Gala Sponsor: Tabl’eau Filtered Water. The Honourable Brian Mulroney & Mila Mulroney. Walter Schneider received the 2017 Visionary Award for Business Leader of the Year. DFF Celebates 30 & Canada Celebrates 150! n Thursday, October 19th, the David Foster Foundation joined Trans Canada Trail (TCT), to celebrate The Great Trail connecting with David Foster Way in Victoria, British Columbia. The connection marked The Great Trails completion, linking all 13 provinces and territories across Canada. A celebration of the connection was held at the Inn at Laurel Point, hosted by Valerie Pringle, co-chair of the Trans Canada Trail (TCT). David Foster made a trip to his hometown to unveil a plaque marking the milestone. In attendance were The Honourable Judith Guichon, Lieutenant Governor of British Columbia, TCT enthusiasts, volunteers and donors. The Victoria Conservatory of Music performed some of David’s greatest hits. The idea for The Great Trail, formerly known as the Trans Canada Trail, has been 25 years in the making. After Canada’s 125th year celebrations, Bill Pratt and Pierre Camu envisioned joining Canada’s network of recreational trails spanning our diverse lands from coast to coast, uniting them as one. In celebration of Canada’s 150th birthday, people came together to help connect the remaining 2,200 kilometres of the trail. The City of Victoria honoured David Foster by naming the harbour waterfront pathway after him in 2013. Foster Way has connected residents and visitors to special places in Victoria for years and will now be a part of the iconic national trail. The Great Trail links 15,000 communities across 24,000 km, uniting all Canadians in a common appreciation for our beautiful landscape. This winter, bundle up and enjoy time in the great outdoors with the people you love. David Foster unveiling The Great Trail connecting to David Foster Way. teven Reilander was born with cystic fibrosis, causing cirrhosis of his liver. He was 11 years old when he had his liver transplant at the London Health Sciences Centre. As a child, Steven’s focus was sports. Leading up to his transplant he could no longer participate in athletic activities and had become too sick to attend school. On top of battling his health issues, Steven found the loneliness challenging to overcome. The David Foster Foundation provided flights, accommodations, and other financial support to ensure that Steven’s family could be present during his surgery and after. This meant that Steven could have his parents, brother and sister by his side, during a time of isolation from his friends and peers, without the added stress of finances. Today, Steven Reilander is a filmmaker and photographer. Since his transplant, he has graduated from university, travelled extensively, gone skydiving and hang gliding, and learned to play guitar. When he’s not behind the camera, Steven is also a public speaker, has been a part of starting a successful family business and has helped raise over $100,000 for the David Foster Foundation. arah-Lyn Copeland was born October 19th, 1995, in Barrie, Ontario. She had a double lung transplant at SickKids Hospital in Toronto when she was 17. Sarah-Lyn was on oxygen 24/7 and home schooled during the 13 months that she waited for her transplant. The David Foster Foundation provided support so that Sarah-Lyn’s mom was able to stay at home and provide her daughter the care that she needed, without the financial stress of not working. After receiving her lungs, Sarah-Lyn went from struggling to go up the stairs in her own home, to being able to run with her dogs—a goal she set for herself while waiting for her transplant. It had always been Sarah-Lyn’s dream to work with animals. Today, she has been able to finish school and is currently in the hiring process for a job with the Ontario SPCA (Ontario Society for the Prevention of Cruelty to Animals).